hat do you call a Church of God minister who loves 100-mile runs, is a new father, and works to build bridges between Hispanics and Anglos? His name is Mario Mendoza. He and his wife, Jade, are involved in ministry at Father’s House Church of God in Bend, Oregon, and the parents of 2-month old Jair. Mario is a 32-year-old Mexican-American and a professional ultra-marathoner. He is using his love for running as a platform for sharing his faith and building bridges. A marathon is 26.2 miles. Any race over that length is considered an ultra. The first ultra-marathon level is typically 50 kilometers (31 miles). However, the focus is on the 50- to 100-mile distance. And these races are typically run on trails, often going up and down mountains. Among tens of thousands of ultra-marathoners in the U.S., Mario is one of the best. He has led the American team at world championships three times, and has placed in the top 10 twice. He has won the 100-k Trail National Championship, and was named “USA Track and Field Trail Runner of the Year” in the sub-ultra category in 2010, 2013, and 2017. Mendoza has sponsors that pay for his running gear. And one company, Skechers, pays him bonuses if he can reach certain goals in major races. “It is an incentive to think, There is a chance if I go to this race and do really well, at least I’ll be able to pay off the finances that went into it,” Mario said. “It costs money to travel to the race and stay there. And it is a huge time investment. 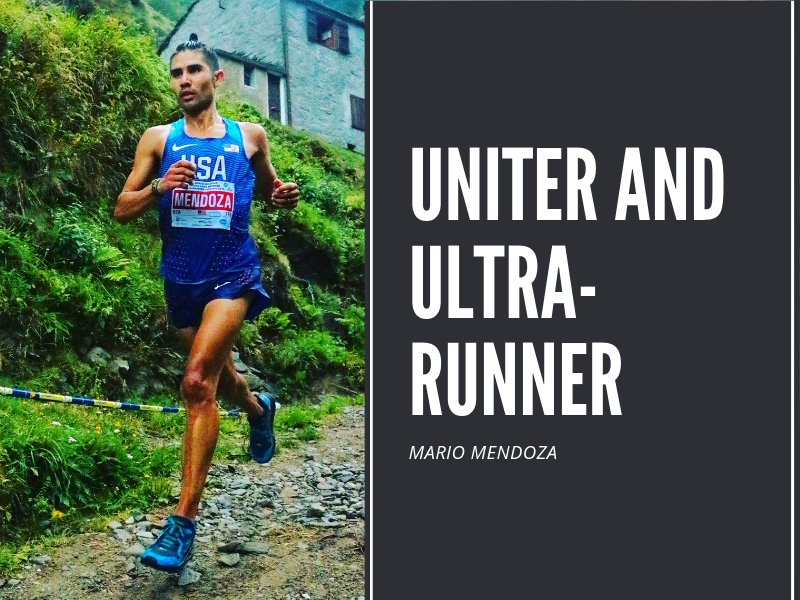 Thus, Mendoza keeps running around 10 races a year because it is a passion—something he loves to do—and because it has a positive spiritual impact on his life. “When I’m running, I feel like that’s a part of how God made me. The type of running that I like the most is mountains—really steep mountains. “When I look at mountains, I see God in them. I think, God, wow, how did You make that? How did You create it so beautifully? If I could run a mountain every day, that’s what I would do. A lot of times, I experience God’s presence there. “When I went to Spain for the 2018 world championship, the whole route was running 55 miles to the top of Penyalogosa. They call it the ‘holy mountain,’ where people would take a pilgrimage to pray to God. Scripture tells us that for the joy set before Him, Christ endured the cross. In a much smaller scale, I put something that brings joy at the finish line and tell myself to endure because it will be worth it. Mario said that five times in the last six months, nonreligious publications have shared his whole story, and “thousands of people are listening to the podcast or picking up the article.” Also, he is completing a video featuring his faith that has been approved for broadcast by a local ABC station. Even more important, Mario says, is when he gets to tell his story in person. This happens in local high schools and on mission trips to Mexico, where his parents grew up. On those occasions, he talks about his childhood and his challenges as a long-distance runner. He grew up living on an avocado ranch in Cambria, California, and was torn between the Mexican and American cultures. He said, “It took me a while to figure out that God saw me as both. Now in this time we’re seeing, I feel this is a role God planned for me. Mario became acquainted with the church when he was in Salem—about two and half hours away from Bend—for a graduation event and a race. There he met a leader from the church who invited him to a Bible study. Mario thought he might try it. About a year later, Pastor Randy Wills asked Mario about becoming the associate pastor. So he obtained his Church of God ministerial credentials, and served in that role for a year and a half. Then he felt the calling to take more ministry trips to Mexico. Jade became pregnant during one of those trips, and Jair was born on September 16—Mexican Independence Day. The Mendozas took this as confirmation that, step by step, they are to continue pursuing ministry in Mexico. Mario grew up as a Catholic. When he went to college, he wanted to go deeper in his relationship with God. So he began studying Scripture and praying on his own. Then he started attending a small Calvary Chapel congregation near the school. “God grabbed hold of my heart,” he said. “When I finally learned what life was like sharing it with Him, that’s all I wanted. I didn’t want to go back to running races for myself, being disappointed if I lost, or thinking, Oh, I’m really fast! when I won. To learn more about Mario and Jade’s ministry, visit their website, beautifulfeetproject.com.